Natural gas regulators may require adjustment as a result of changes in the system or incorrect adjustment by service personnel. In such cases, the pilot lights may go out, the appliance flames may be slow to ignite or not burn properly and the starting of one appliance may affect the operation of other appliances. Such problems may be caused by an incorrect pressure setting and the main regulator can be adjusted to see if such pressure changes solve the problem. 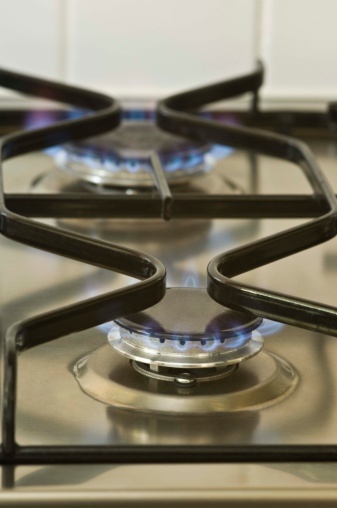 Many cooks prefer natural gas stoves to electric models. Locate the main natural gas regulator. The outside regulator before the meter is owned by the gas utility and must not be touched. There may also be regulators attached to individual appliances but these are usually not adjustable. The regulator to be adjusted is located close to the entry point of the gas mains into the house and after the gas meter. This regulator is owned by the homeowner and he is responsible for it. Shut off the gas. Attach the pressure gauge to the outlet tap of the regulator. Turn on the gas and read the pressure. Switch on various appliances and appliance combinations and read the pressure for each one. The pressure should remain constant. If it varies for certain appliances or combination of appliances, adjusting the pressure may solve the problem. Pull off the regulator cap. There is a spring and an adjusting screw underneath. Usually turning the screw clockwise increases outlet pressure but the direction of adjustment is marked on the regulator. Turn the screw a little to make a small pressure increase adjustment as seen on the pressure gauge. The gas pressure is only slightly above atmospheric pressure so small adjustments have a large effect. Recreate the appliance configurations which had the greatest pressure variations and see if there is an improvement. Make further adjustments as necessary to obtain a fairly constant pressure. Switch off the gas. Remove the pressure gauge and switch the gas back on. Replace the protective cap.